Ralph and I are both visionaries but with different approaches to the challenge of turning our visions into reality. Thus far, both of us have failed. We both have an idea of how to change and improve the world but our visions depend on the involvement of other people. We can’t do it ourselves. Ralph (I use his first name, not out of any disrespect, but because I’m three years his senior) set out his vision in a 500-page book called Only the Super-Rich Can Save Us Now! I did it in a 70-page book called The Coming Global Coalescence. Ralph then has Warren call together sixteen other movers and shakers (such as Bill Cosby, Yoko Ono, Bill Gate’s father, Ross Perot, George Soros, and Ted Turner) and persuades them to join him in changing, not the world, but the United States, at least at the start. And for 500 pages he explains in considerable detail how each one contributed their special expertise to the effort. I think I know exactly how Ralph felt as he finished writing his fantasy. Sending the manuscript off to the publisher, he no doubt harbored the hope that when the seventeen fictionalized characters read what he had planned for them, they would buy into Ralph’s vision and turn it into reality. Sad to say, it didn’t happen. Similarly, in my book I predicted the collapse of the global financial system but then fantasized how we could come together and create a new world order with a specific focus on approaching the situation as a design and engineering challenge at the heart of which was a proposal for a Whole Earth Design Project inspired by the futurist R. Buckminster Fuller’s concept of the World Game. And when I finished writing the book, had it self-published, and built a website to support the concept, I imagined that readers would recognize the wisdom behind the vision and join in transforming it into reality. Sad to say, that didn’t happen either. An especially poignant moment in Ralph’s effort was his appearance recently at the New York Public Library where he shared the stage with the real-life versions of two of his fictionalized characters in an effort to prod them to join him in the pursuit of his fantasy. One was Ted Turner, the founder of CNN and the organizer and sponsor of the United Nations Foundation to which he donated one billion dollars. The other was Peter Lewis, CEO of Progressive Insurance Company. But as Ralph tried to persuade them that they could be important instruments of change, they both resisted. Ted Turner responded that it is not nearly as easy as it may seem. And Peter Lewis reported that a lot of people come to him for his support for various liberal causes. (He is quite active, for example, in trying to get marijuana legalized in Colorado.) But their ideas were always too vague, and there was never any clear-cut plan to explain how an expenditure of a certain amount of money would produce the hoped-for results. After an hour and a half of pleading his case, and getting nowhere, the session ended without either of his two super-rich guests joining Ralph in the pursuit of his fantasy. You can watch the discussion by clicking on the link below. 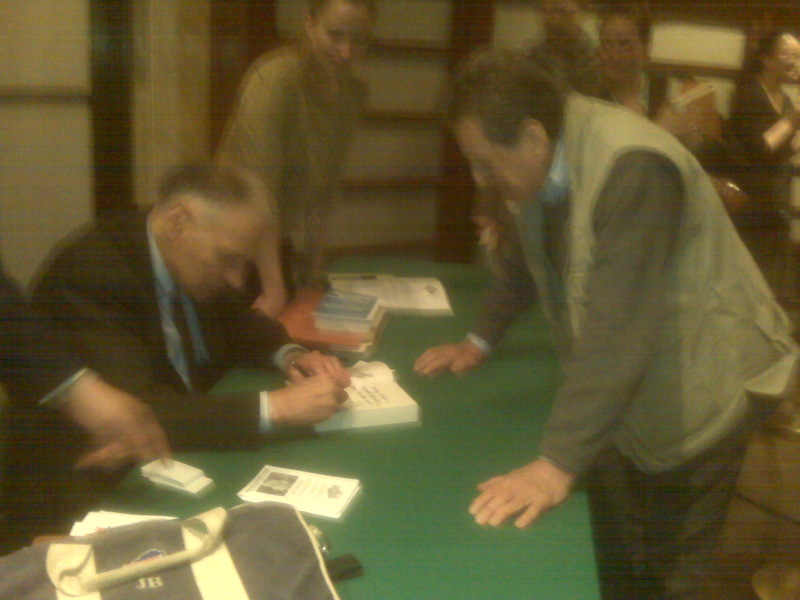 As soon as the session ended, I hurried to the stage and was able to hand each one of them a copy of my book. I also had in my possession a copy of Ralph’s book and when he started signing books, I got in line. I was delighted to see that his copy of my book was right there on the table by his side. He inscribed my copy of his book with “To imagine is to envision!” Amen to that. Truth to tell, I don’t believe his fantasy will become a reality. And if he read my book, I doubt that he would feel any differently about my fantasy. But at least we’re both trying, and I don’t think either of us will give up.